Android Fastboot Reset Tool is the highly useful tool for Android users. It offers a number of features which includes bypassing FRP via Fastboot Mode, Remove Mi Account, Remove Pattern, Unlock Bootloader and many more. 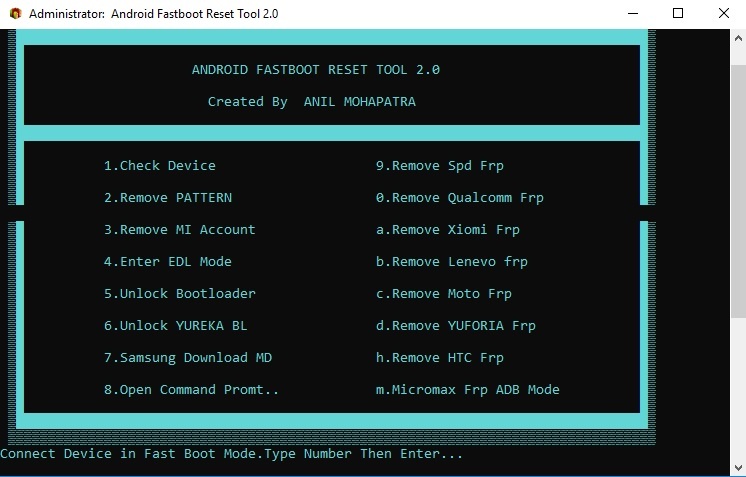 Android Fastboot Reset Tool is updated to version 2.0 with more features and here on this page, you can download Android Fastboot Reset Tool 1.2 by Tech Anil. Basically, Android Fastboot Reset Tool is a bypassing tool for Android Smartphones. This Android Fastboot reset 2.0 Tool functions with virtually every android mobile phone. Plus it supports many Android Smart-phones including Lava Iris Smartphone, Samsung Smartphone, Lava Smartphone. Now you will download Android Fastboot reset tool computer software newest version with no price. It works for windows pc system only. The newest version of Android FastBoot reset Tool is now released, and you may download it by going to the downloads area. Applying this technique, you might eliminate Android FRP with no problems, then use this android fastboot reset tool to take out the routine lock or lock from the Android Phone or Tablet. With the help of Android Fastboot Reset Tool, you can easily eliminate or remove any kind of phone lock from the home screen. Not only screen lock but also you can eliminate MI Account or Google Account from a locked device. The additional feature of Android Fastboot Tool is that you can unlock the bootloader of any Android smartphone utilizing the advantage of Android Fastboot Reset Tool. Also, you can boot your smartphone into the EDL mode using the Android Fastboot Reset Tool. Step1: Download Android Fastboot Reset Tool v2.0 from below given link. Step3: Now open the folder and click on Android Fastboot Reset Tool V12.0.exe. Warning – MobileRdx.com is not responsible for any damage that occurs to your phone during flashing process.